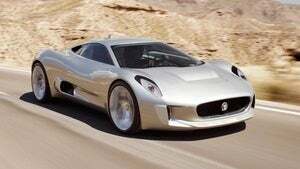 Jaguar just confirmed today it will build the stunning C-X75 concept car first seen at last year's Paris Motor Show as a highly-exclusive hybrid supercar. How exclusive? It'll cost you $1.1 million just to walk through the dealership doors. The C-X75 concept was designed with the intent to move Jaguar's styling into something new and evolved, reviving the promise of the XJ220 two-seat supercar from the 1990s; one vehicle that carriers every engineering resource Jaguar can muster. The design mixed a number of cues from Jaguar's modern lineup, but in shape and proportion resembles the 1966 XJ13 Le Mans prototype, a car Jaguar chief designer Ian Callum tags as "possibly the most beautiful Jaguar ever made." The production car will become the British marque's most advanced model to date, with performance that will supposedly claw out a 0-to-60 time of just three seconds and a top speed in excess of 200 mph. Sadly, although the concept showed off some trick concept turbine technology that was powered by butterfly tears, the real production car will not feature such magic and mystery. Instead of Gummi Berry juice, Jaguar plans to use a small-capacity, highly-boosted internal combustion engine with a "powerful" electric motor at each axle to get the car to bounce here and there and everywhere. How powerful? We have no idea and Jaguar ain't yet saying. So whether that small boosted engine and two electric motors will get it to the claimed 780 HP of the concept is anyone's guess. Only 250 examples will be built, each costing between $1.1 and $1.4 million, depending on market and local taxes. That's a pricey pussycat, but if it looks like what we saw in Paris, then it may very well be worth it.